Admittedly, I’m still on a not-so-silent crusade to get a cat. A large part of my job is to poke around the Internet for cat and dog videos, memes and stories, and occasionally I come across the right cat video to make me swoon. Then I promptly text Mike to once again ask if we can get a cat, at which time he promptly says absolutely not. I’m wearing him down slowly, I can feel it. Madison will be a whole other story, because she has no love for cats and thinks they’re all squirrels she can torture. That would certainly make for some good videos though. 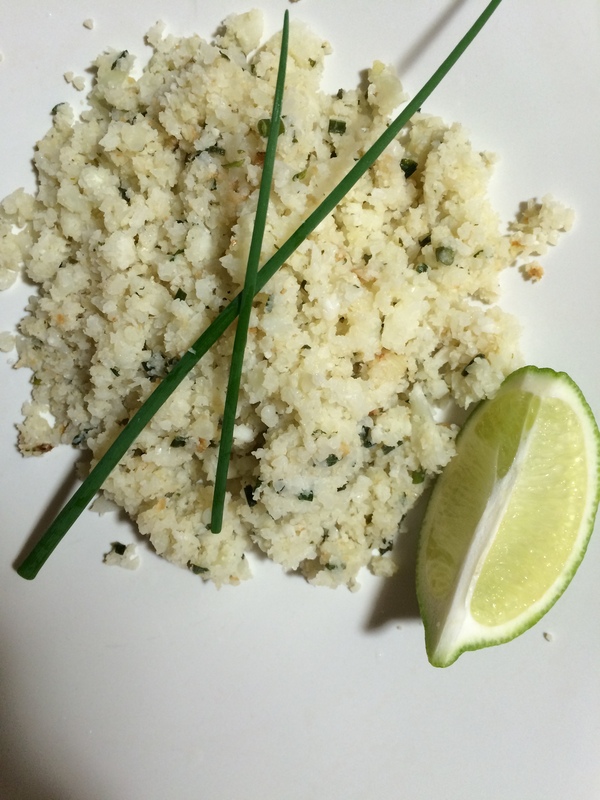 I may not have a cat, but I have this cauliflower rice dish, which is going to be just enough, for now. 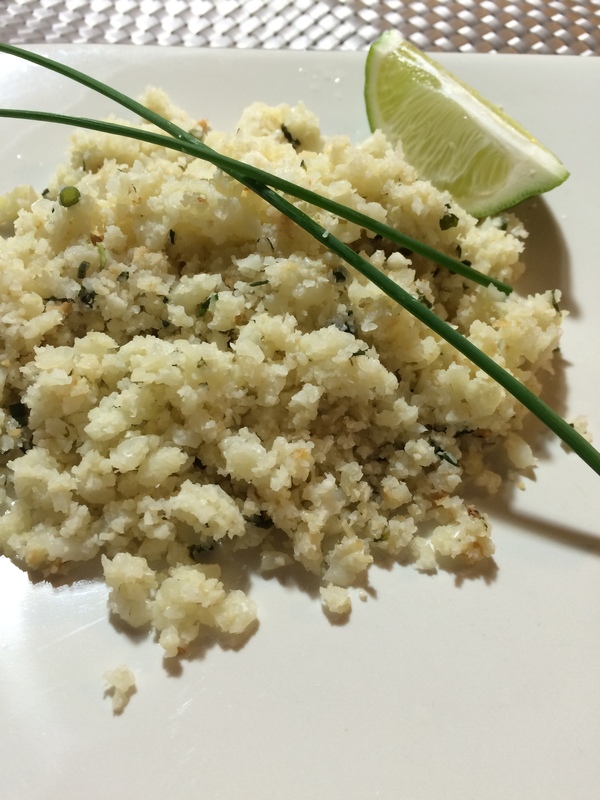 Put the cauliflower into a food processor and pulse until the cauliflower becomes a rice-like texture. In a large bowl, combine the rice, olive oil, minced garlic, scallions, lime juice, cilantro and pistachios, stirring well to fully combine. Chill in the refrigerator or heat in an oven or microwave depending on your desired temperature for serving. I served mine warm with a piece of seasoned chicken. Drizzle very lightly with the honey. 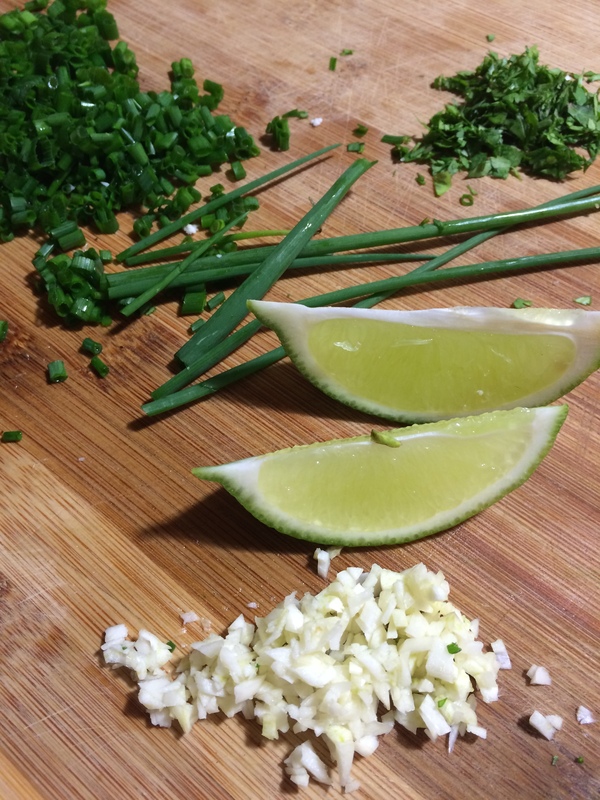 Top with the scallions for garnish, and a lime wedge on the side if desired! Delish! I like getting my nails done. Mind you, this is not an activity I nor anyone who knows me would have guessed I would enjoy. I have always been a tomboy-type – an outdoor-loving, dirt-under-the-fingernails kind of girl. I don’t wear makeup and don’t plan on starting anytime soon, and I own exactly two pairs of heels that gather dust until a specific social event forces me to put them on. Somehow, though, my nails have always been the exception. I like to take one night each month and labor over all 20 of them, filing and buffering, gently brushing on smooth coats of deep reds, purples and bright pinks. And then, because I can’t just stop there, I apply some pretty little stickers to my thumbs and big toes and seal them over with a clear topcoat. What do manicures have to do with cooking, you ask? Nothing. Except that eating carrots is supposed to make your nails grow stronger and look better, so that is what I was hoping for when I devoured this dish. In a large pot, bring the 3 cups water to a boil. Add the carrots and reduce heat to a simmer and cover. 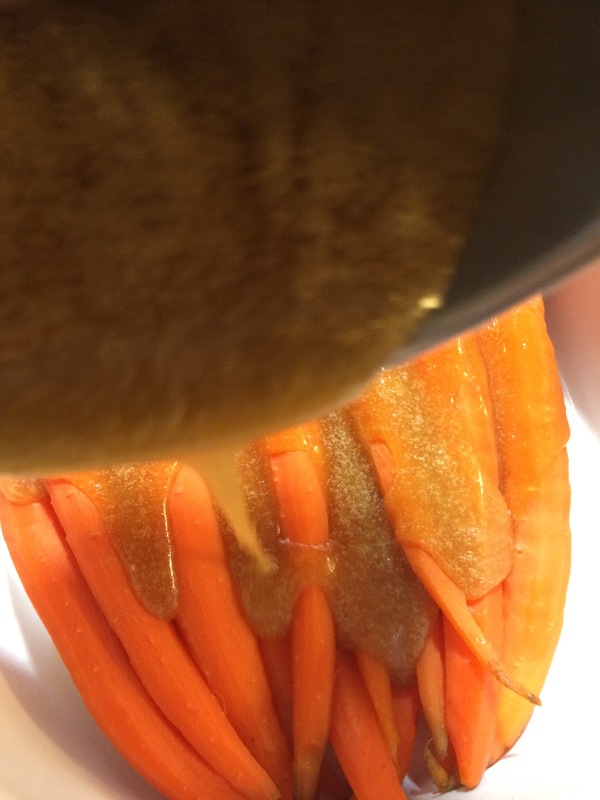 Let simmer for about 10 minutes or until carrots are tender and easily punctured with a fork. While carrots are cooking, mix butter and brown sugar together until they form a glaze. 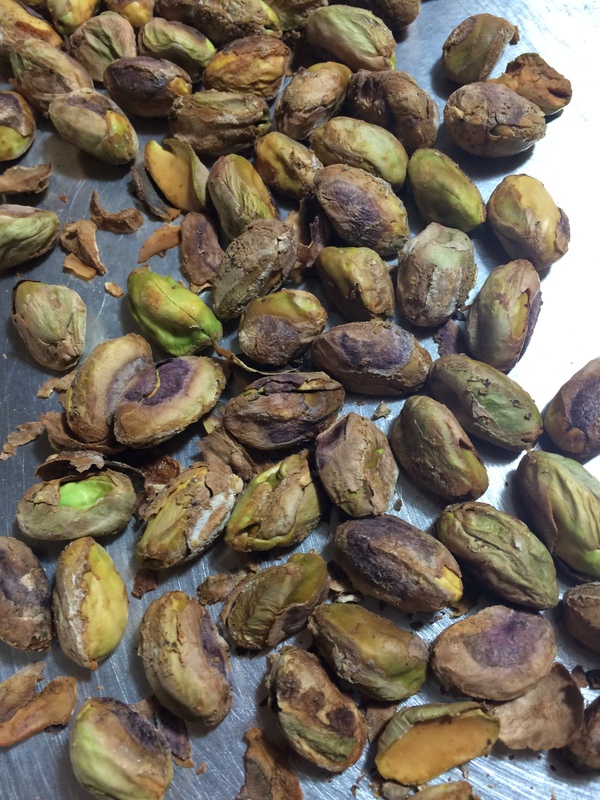 Place pistachios in a single layer on a baking sheet and bake for 5-8 minutes or until just toasted. 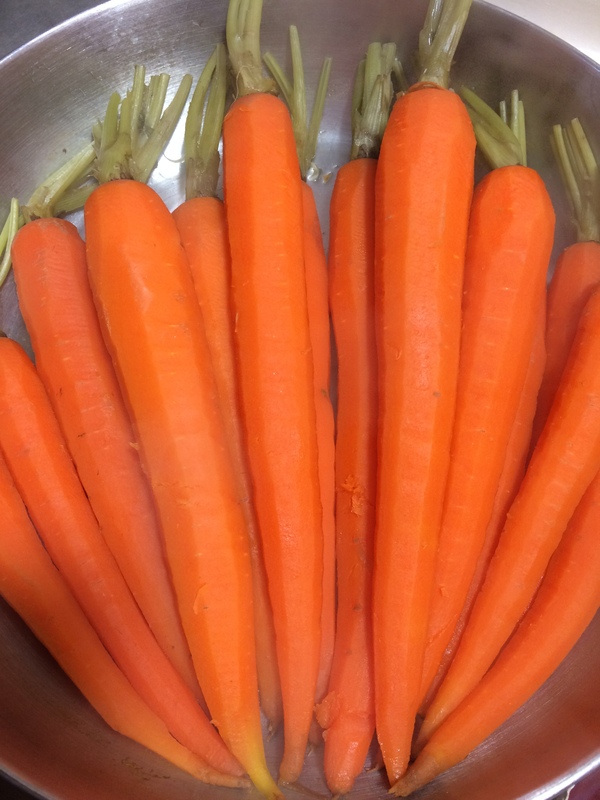 Drain carrots and move to a serving dish, fanning them out to open space between carrots for the glaze to seep through. 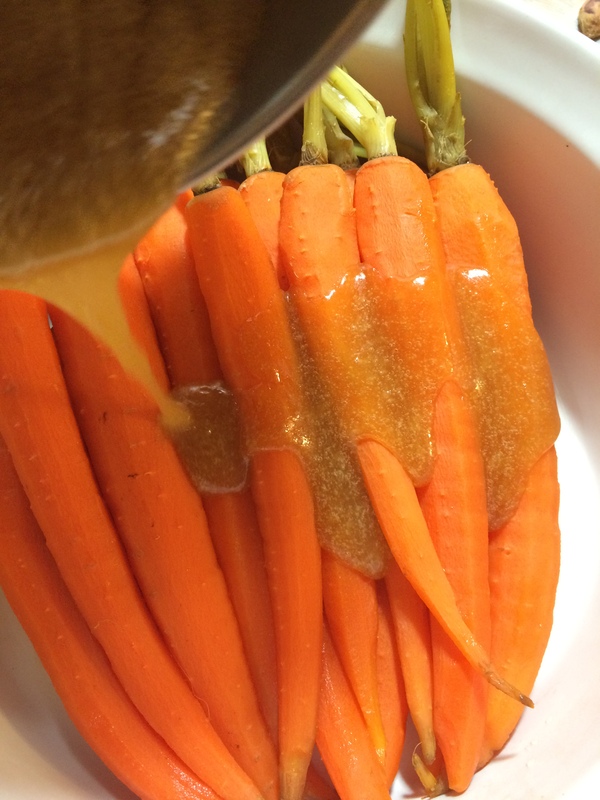 Pour the glaze over the carrots. 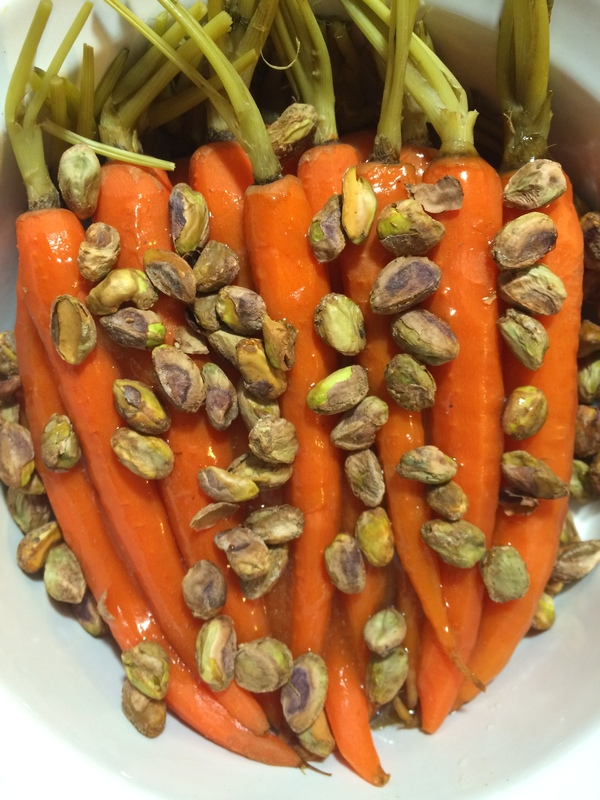 Top with toasted pistachios and serve! 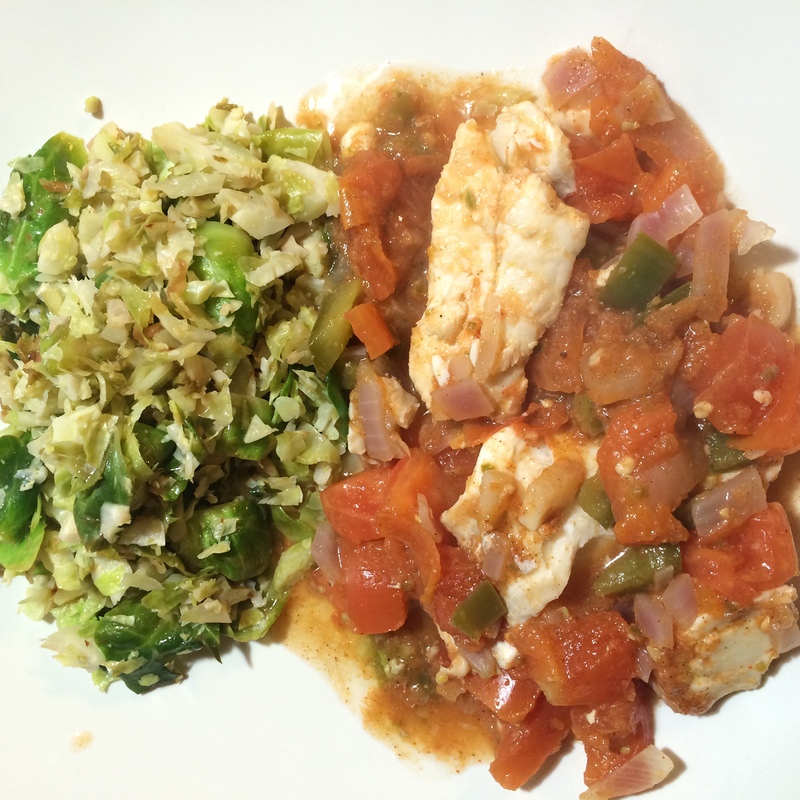 I love making one food out of another, healthier food. 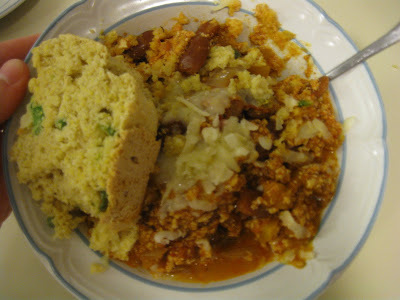 Like making pasta out of vegetables, a pie crust out of quinoa or cous cous out of cauliflower. I actually hardly ever cook using cous cous. 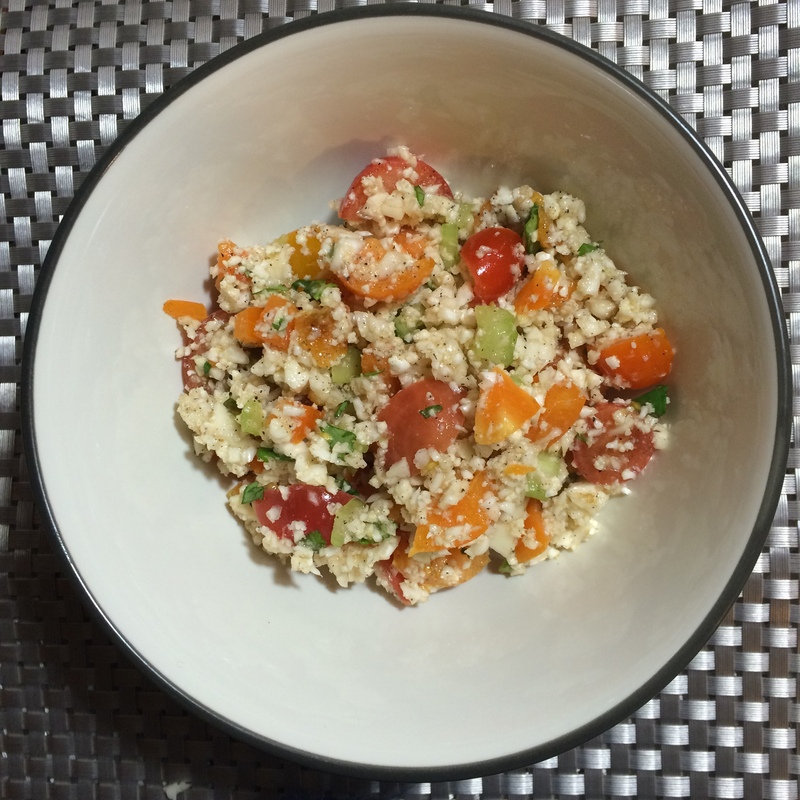 I’d rather use quinoa since it’s gluten free and healthier, but there is definitely something about the texture of cous cous that makes it pretty ideal for meals. That’s why I was thrilled to discover a cous cous recipe that didn’t call for cous cous at all. 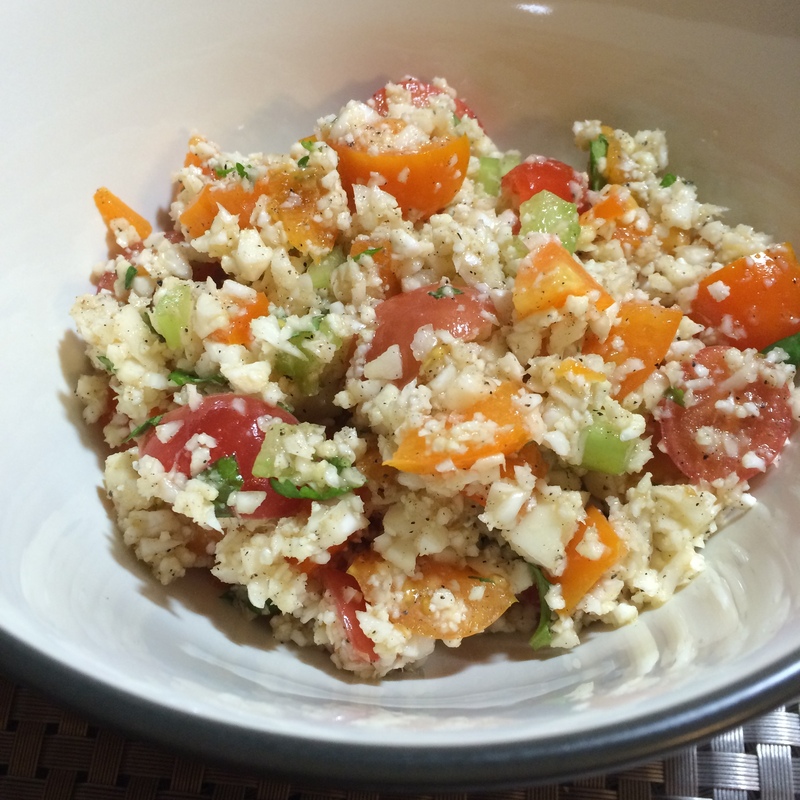 You can easily use cauliflower instead for an all-vegetarian and gluten free dish that is just. so. good. 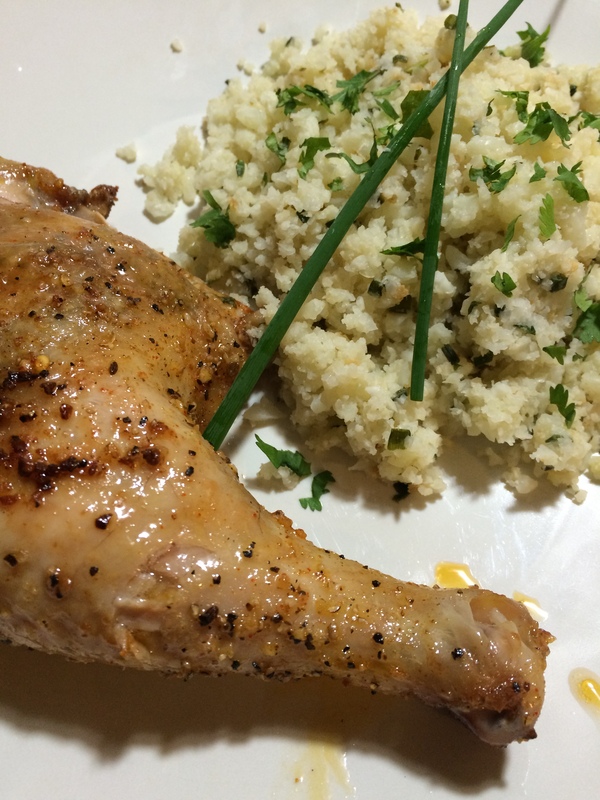 Gently pulse cauliflower in a food processor until it resembles a cous cous-like texture. 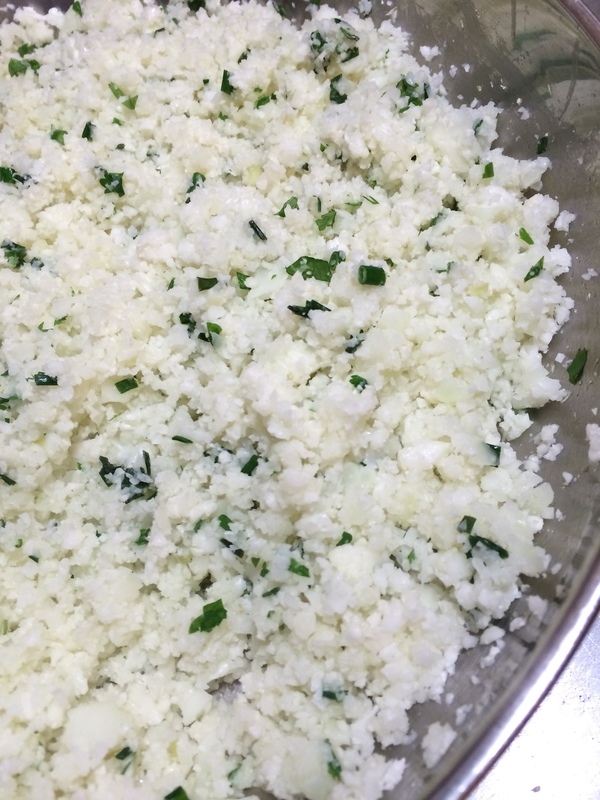 If you don’t have a food processor, just finely chop the cauliflower with a sharp knife until it becomes very small pieces. 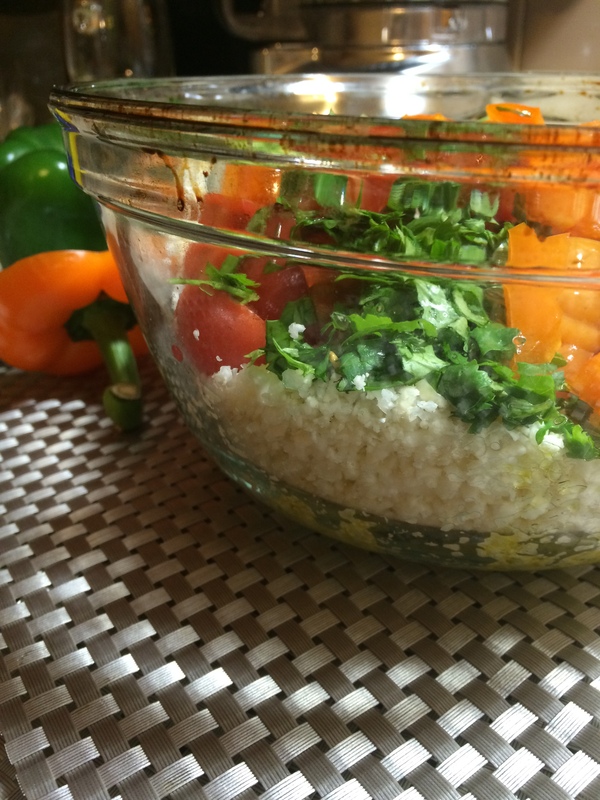 In a large bowl, mix the cauliflower with the remaining ingredients. Stir well and serve! 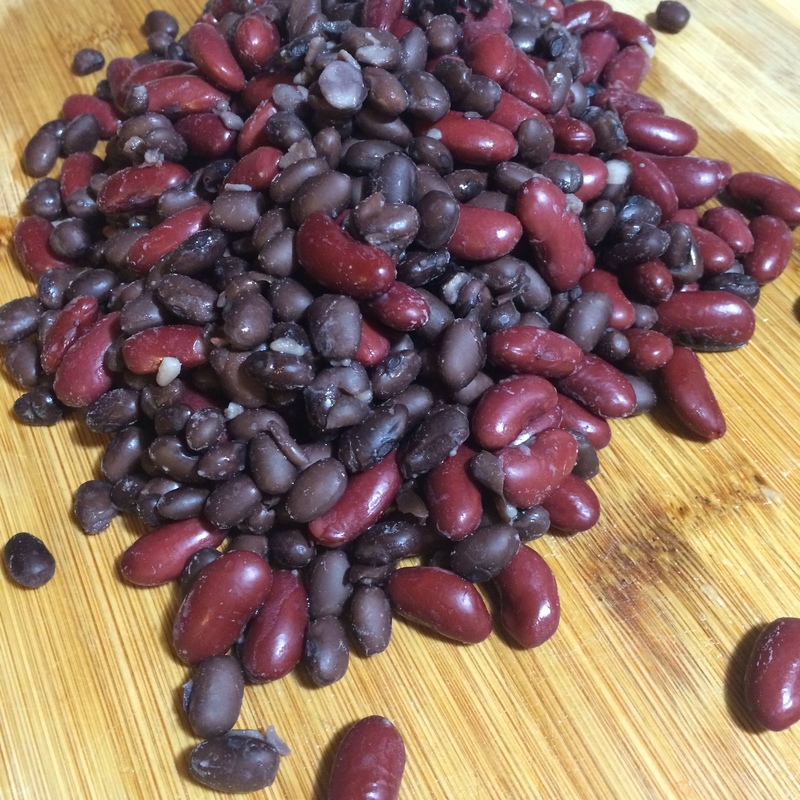 This makes a great side dish, and while it screams summer BBQ, it really works just fine any time of year with your favorite meat, as a filling for stuffed peppers (stay tuned for that recipe), or just mixed in with a salad. 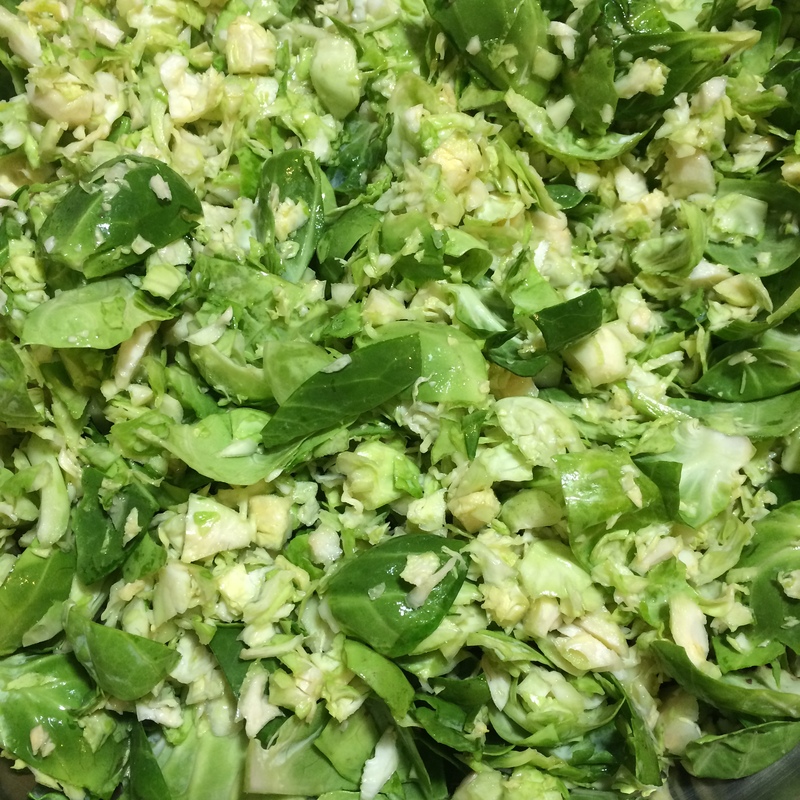 The lemon juice and oil make a nice dressing so you don’t have to add the extra calories. Put some avocado in with it and you’ve got yourself a fantastic meal! Pro Tip: This is a great dish to play with as far as adding your favorite herbs. Add freshly chopped basil, oregano, mint or cilantro or even chopped walnuts or dates to give it some different flavor and texture! So back in the day when I was a budding foodie, I had a food blog on Blogger called Two Peas in a Pot. I was pretty excited about it and posted quite a few recipes. Then I stopped keeping up with it as life got busier, and I let it fall into the great Internet abyss. Appetizing, right? It’s nice that my hand is in the shot, and I’m also pretty sure I had already taken a bite out of that cornbread before snapping this photo. Mike definitely chuckled when I showed him – thank goodness I’ve improved my food photography at least marginally since my old blogging days. But like I said, the recipes aren’t bad. 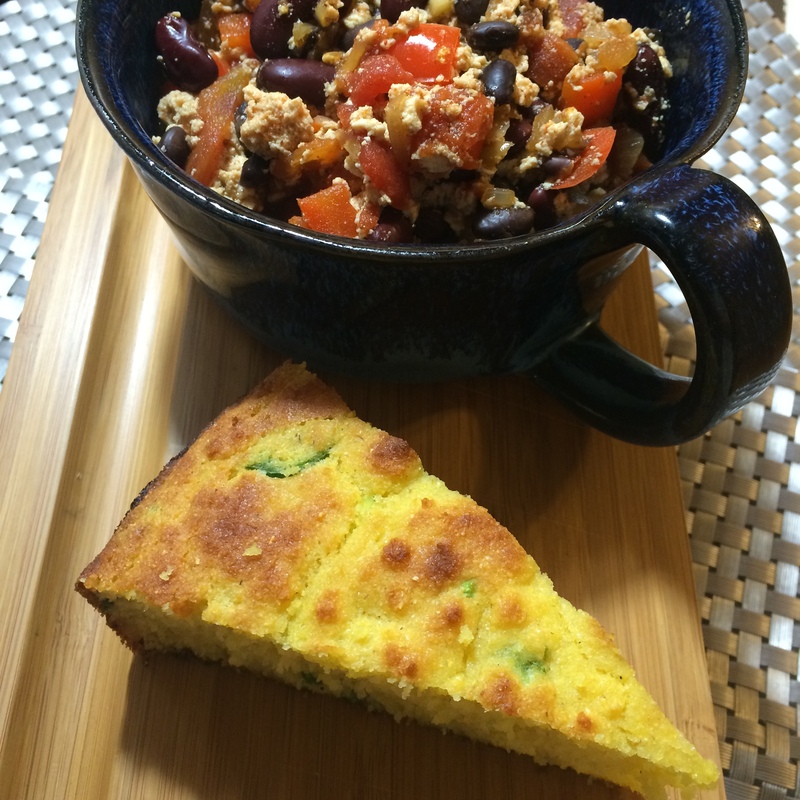 As soon as I came across the honey chili and jalapeno cornbread, I wanted to make it again and see what I could do with it. And honey chili 2.0 has come out fabulously. I love making dinners like this because of the leftovers and because they’re basically just super easy but pack a healthy and filling punch. Plus, this entire meal is 100% gluten free. Even the cornbread. (Honestly for something made primarily of corn you would think it would always be gluten free, but it’s not). 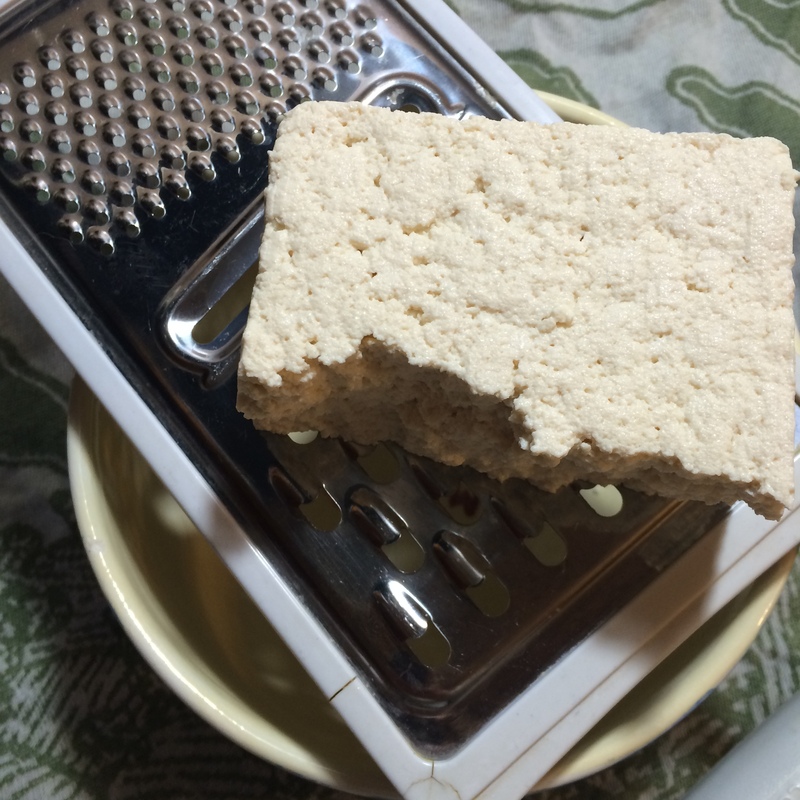 Before doing anything, shred the tofu into a strainer using a cheese grater. This will help remove excess water from the tofu and you can set it aside to drain while you cook. 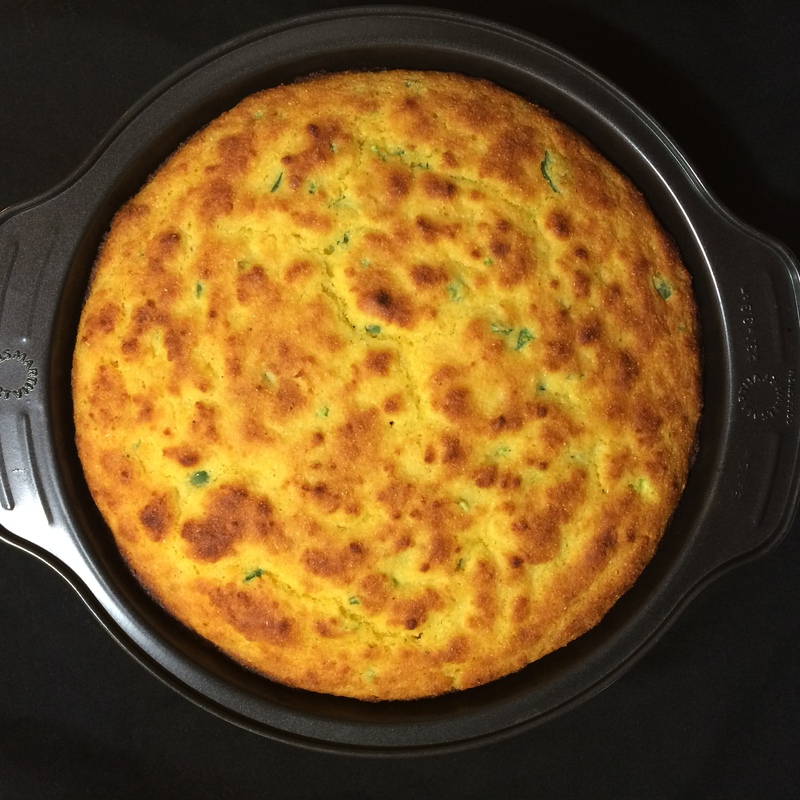 Make the cornbread first, as you can make the rest of the dish while it bakes. In a small bowl, whisk together the cornmeal through baking powder. 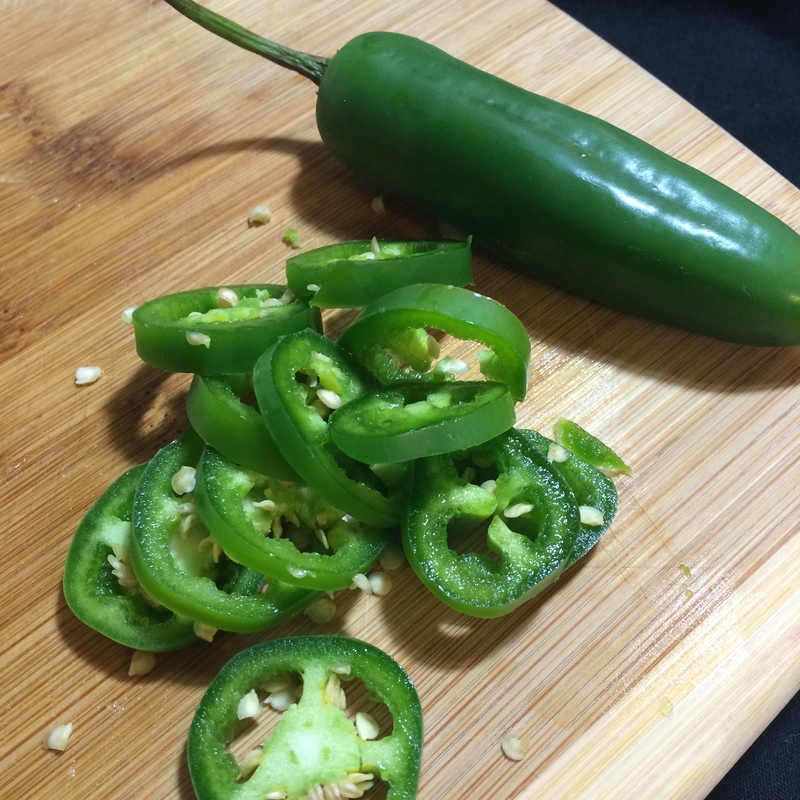 In a separate bowl, mix together the remaining ingredients, including jalapenos. Add dry ingredients to the wet mixture and mix well. The batter will be fairly fluffy in texture. 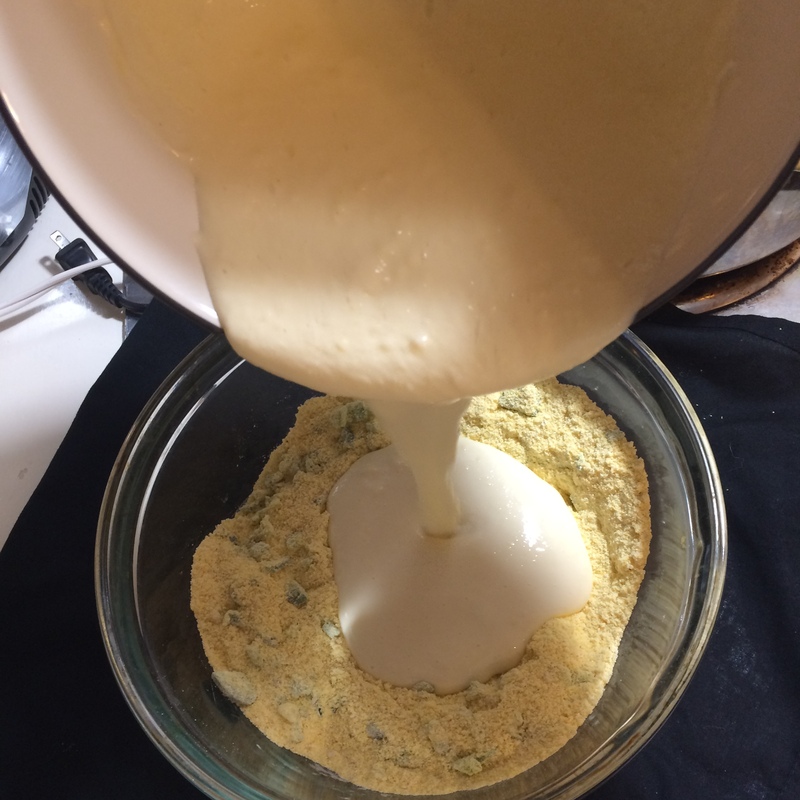 Scrape batter into a well-greased 8-or-9-inch baking pan. I used a round cake pan. Bake for 20 minutes. The top of the cornbread will be a lovely golden brown and the bread is done when a toothpick inserted in the middle comes out clean. While the cornbread is baking, heat oil in a large skillet. Add the onion, bell pepper and garlic and saute until soft. Add the tomatoes and beans and mix well, stirring occasionally until well heated. Then add the spices, honey and vinegar and mix well. Finally, add in the shredded tofu and mix well. The cool thing about this dish is that the shredded tofu adds a hearty meat-like look and feel while keeping it 100% vegetarian. 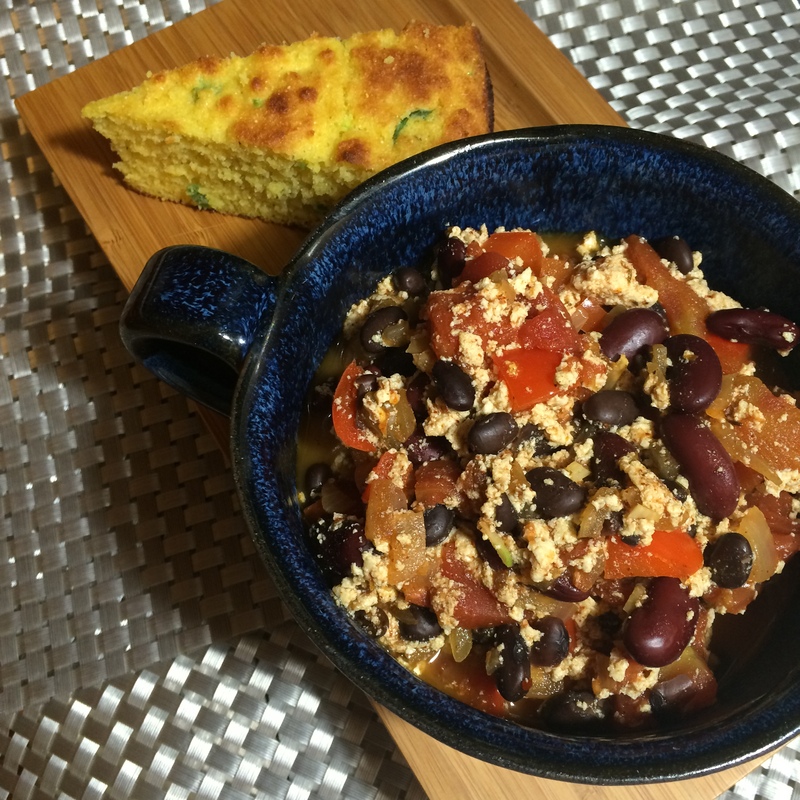 Serve with a slice of cornbread and a sprinkling of cheddar cheese. 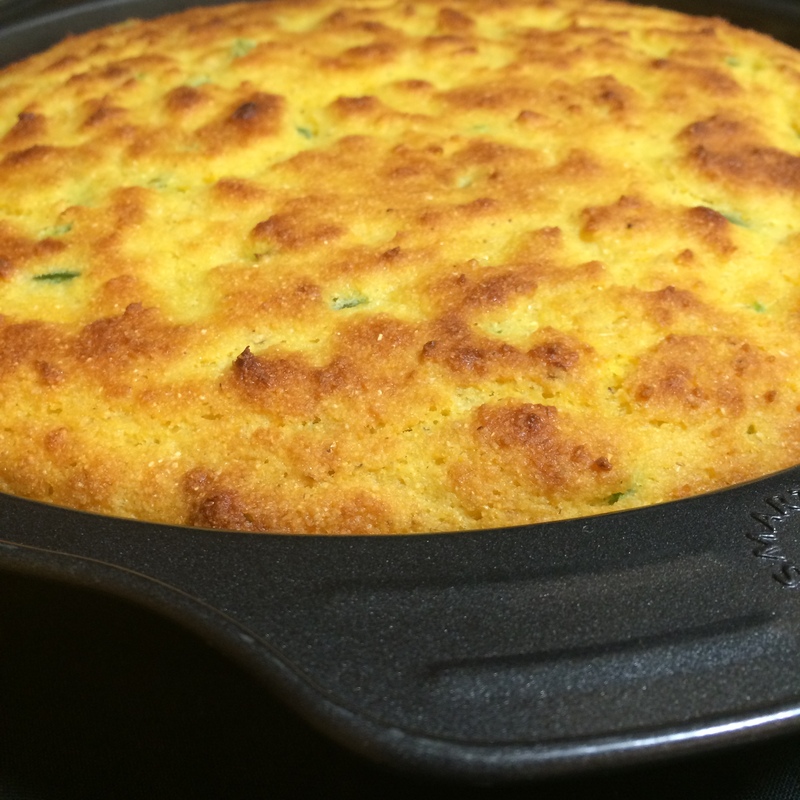 *Pro Tip: Don’t have plain Greek yogurt on hand for the cornbread? Substitute with an equal amount of sour cream or buttermilk. 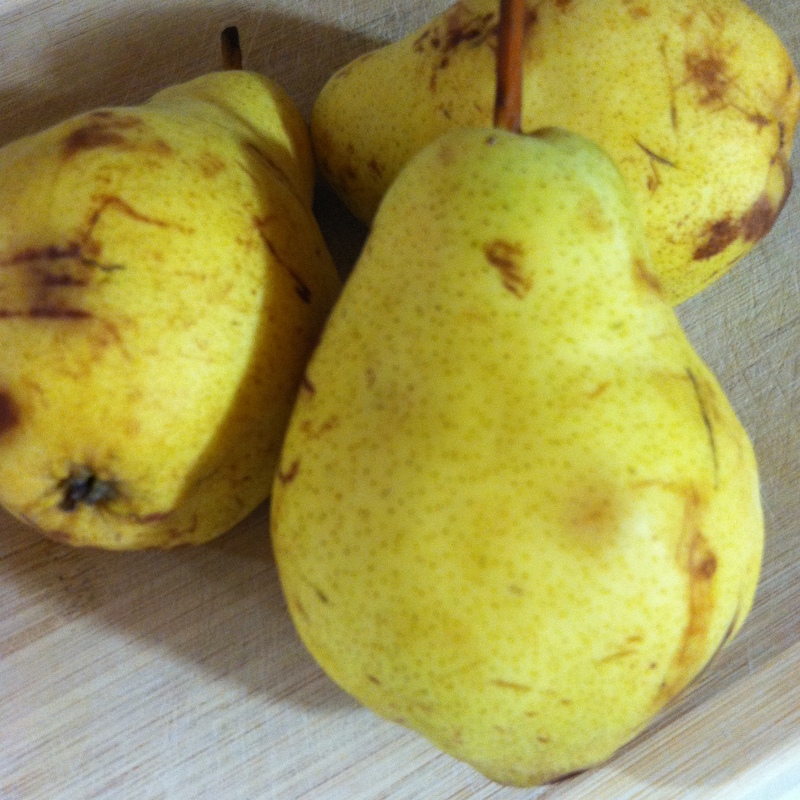 Nothing beats two foods that “pear” together well (har har), and Butternut Squash and Pears are no exception. 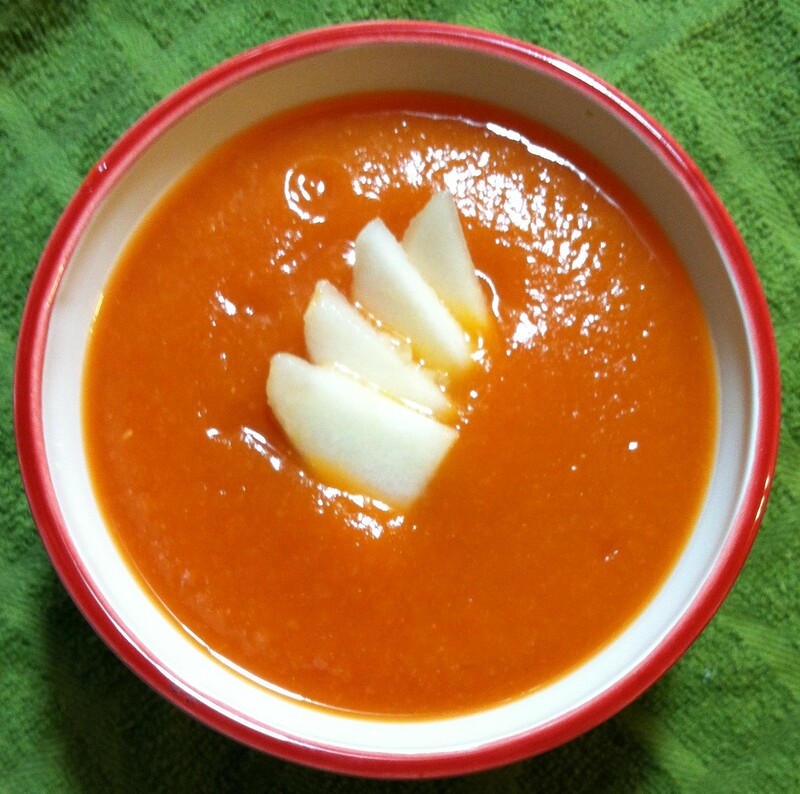 This is a delectable soup perfect for a cold day, and since there will be lots of those coming up, my suggestion is to stock up on Butternut Squash and pears now. Not kidding! 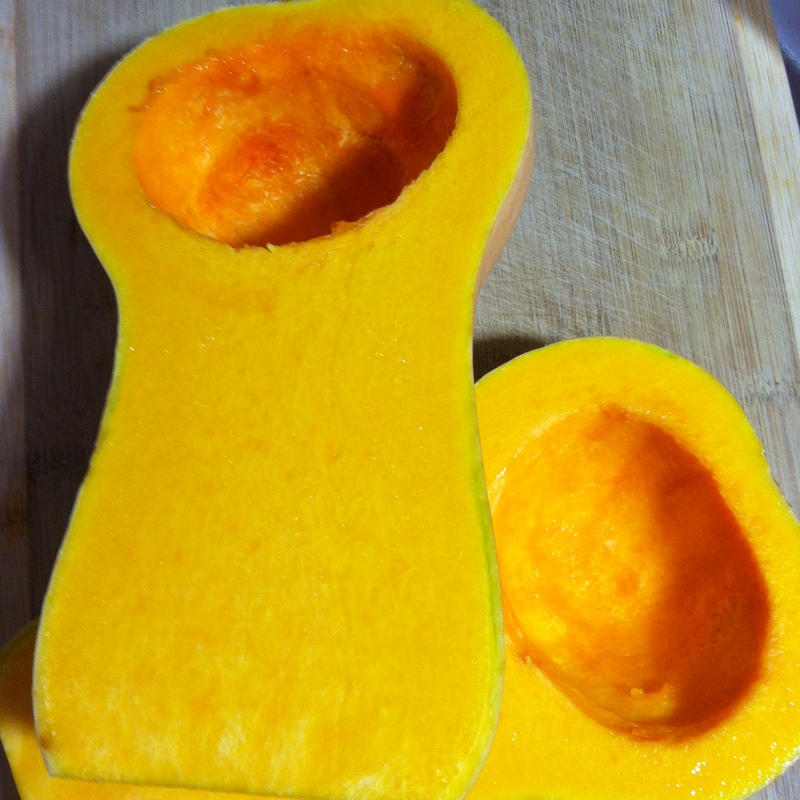 Place the squash facedown on a foil-lined baking sheet and bake for about 20-30 minutes, or until the squash is soft enough to get a fork through. While the squash is cooking, boil water in a large pot and boil the potatoes until soft and cooked through, about 15 minutes. Then drain and set aside. Once the squash is done, pile it into a food processor along with the potato, onion, pears and spices, and give it a good whirl. It should still be fairly thick at this point. Scrape the whole mixture into a large 4 or 5 quart pasta pot and turn the heat up to medium. Gradually add the vegetable broth, stirring constantly, until it is the consistency of, well, a creamy butternut squash and pear soup. (You might find you need more or less broth depending on how you like your soup, but 2 1/2 cups was perfect for mine). Bring to a low boil and then reduce the heat. 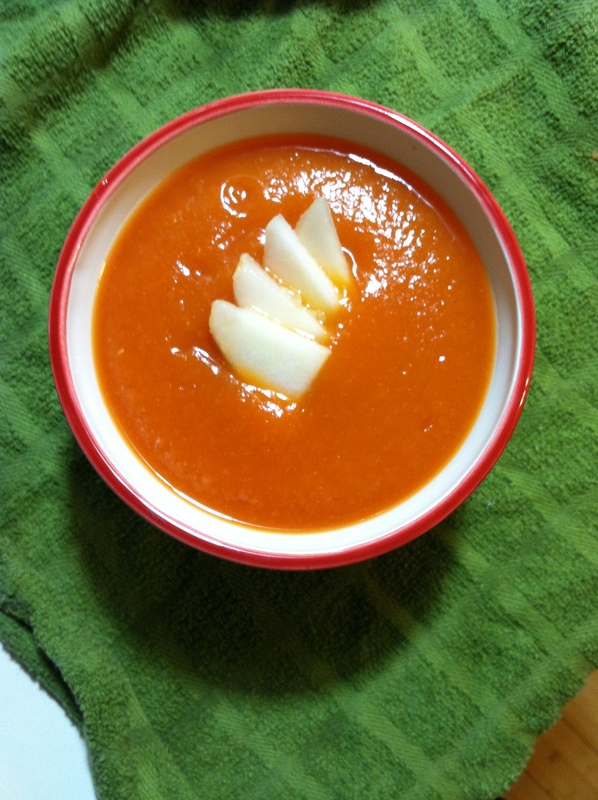 Pour into soup bowls and garnish with a few pear slices, and you’re good to go! Also, I enjoyed this soup with a hearty slice of no-rise whole wheat stout bread. Highly recommend! 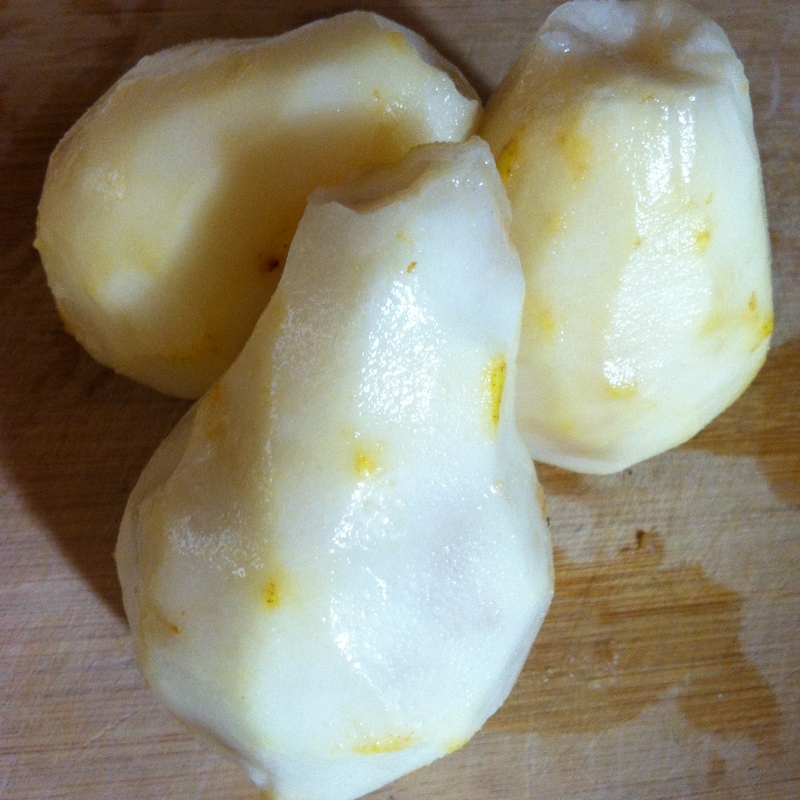 Pro Tip: You can cut your cooking time down if you cut the raw squash into chunks and boil them with the potato. Once they’re soft, drain, and blend with the remaining ingredients. 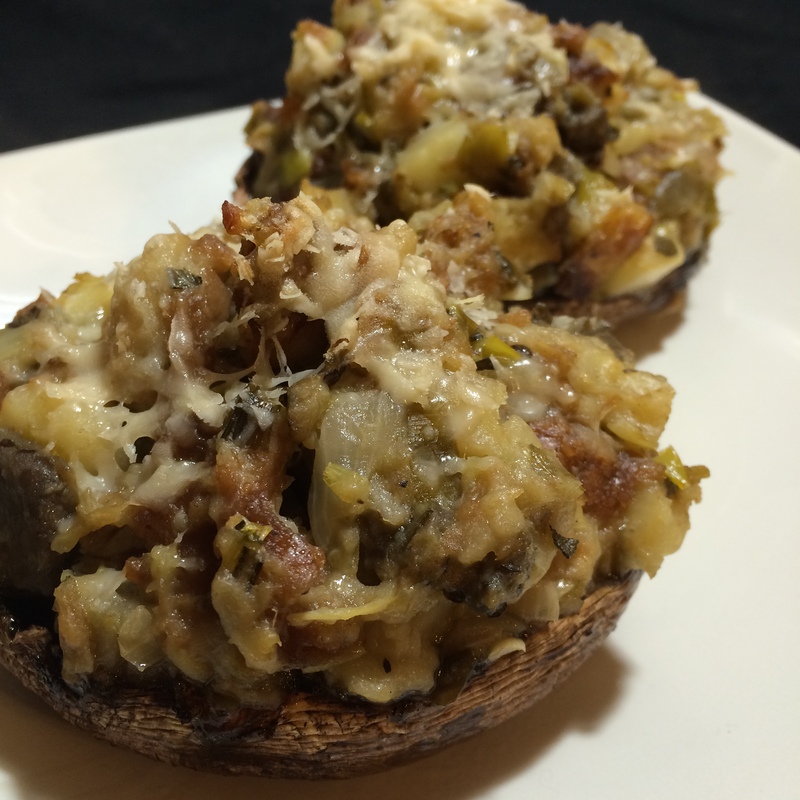 If a mushroom is stuffed with stuffing, is it redundant to call it a stuffing stuffed mushroom? Say that 5 times fast! Either way, the real point here is that stuffing is one of the greatest foods served at the Thanksgiving table. I know I have my whole affinity for squash thing going on, but it’s basically trumped by stuffing. Stuffing is always flavorful and goes so well with all the other foods on your plate – especially the turkey. Even the name stuffing just makes me love it that much more. Stuffing is mostly always served in a big bowl, but for the purpose of my 5-day Thanksgiving meal extravaganza (I’m calling it that now, by the way) I wanted to come up with something that would act as more of an appetizer, and be friendly to those traveling who want to bring something unique that can be easily heated up. 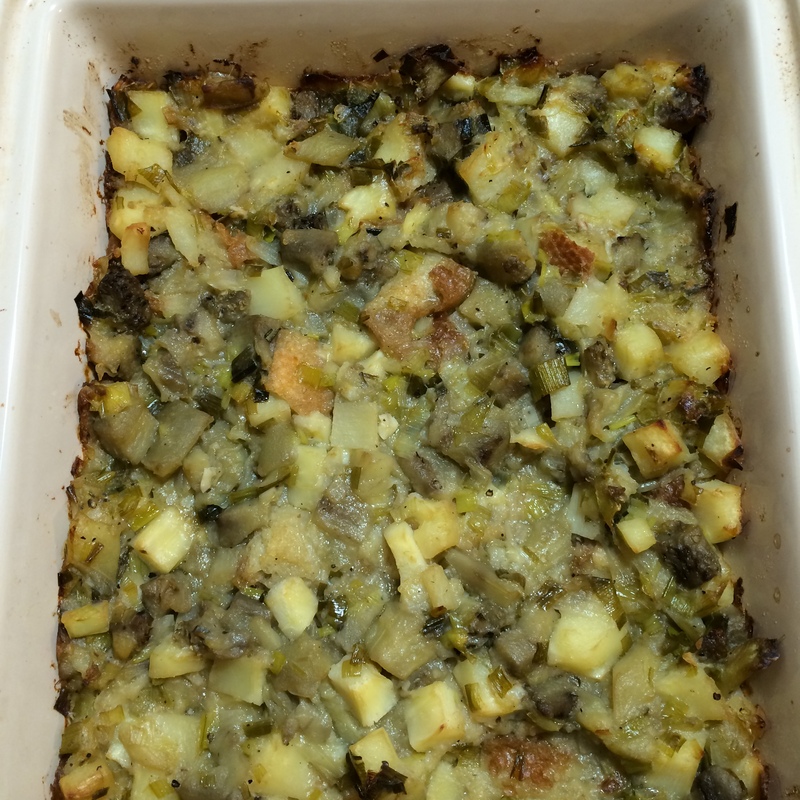 This dish is a fun twist on the classic stuffing in a bowl. And it’s really easy to make. It may look like a staggering amount of ingredients but it’s actually very simple. It does include a homemade vegetable broth so you could always make things easier on yourself and use a store-bought kind. There’s 4 ingredients off the list right there! 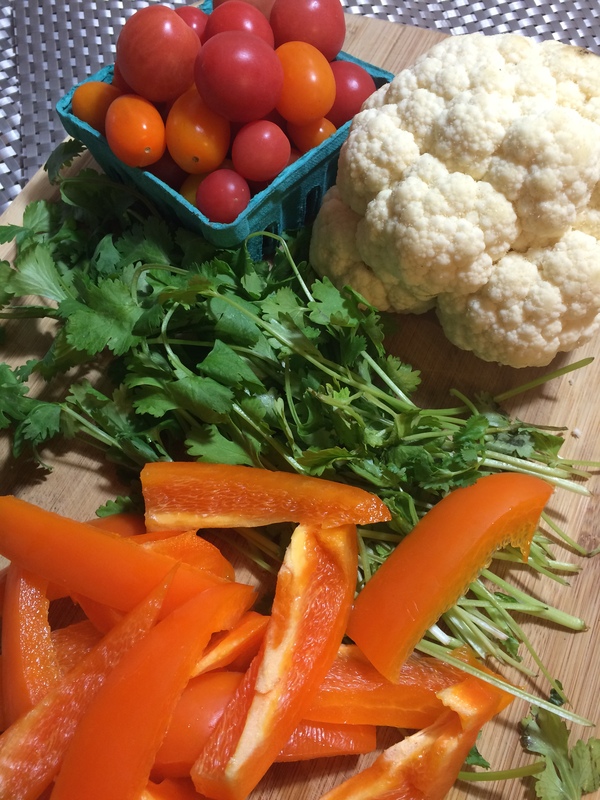 And this recipe has some great vegetables in it that add amazing flavors so you don’t need to add spices outside of a pinch of salt and pepper. In a large saucepan, bring 6 cups of water to a boil. This is for your vegetable broth. 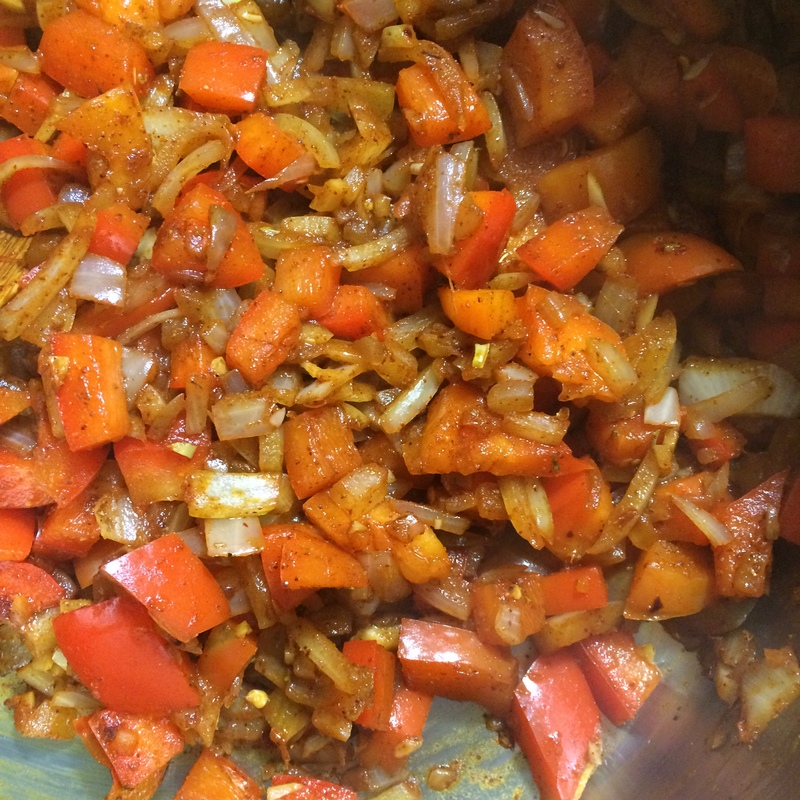 Once the water is boiling, add the leek that is cut in half, the 1/2 tomato, the in-tact onion half and the jalapeno and boil until the vegetables are soft and the water is colored with vegetable leavings. Strain the broth into a separate pot to separate out the vegetables. Discard the vegetables and set 2 cups of the broth aside. (Freeze the rest for future recipes). In a very large skillet, melt the butter. Once melted, add the parsnips and let them simmer in the butter for about 2 minutes. 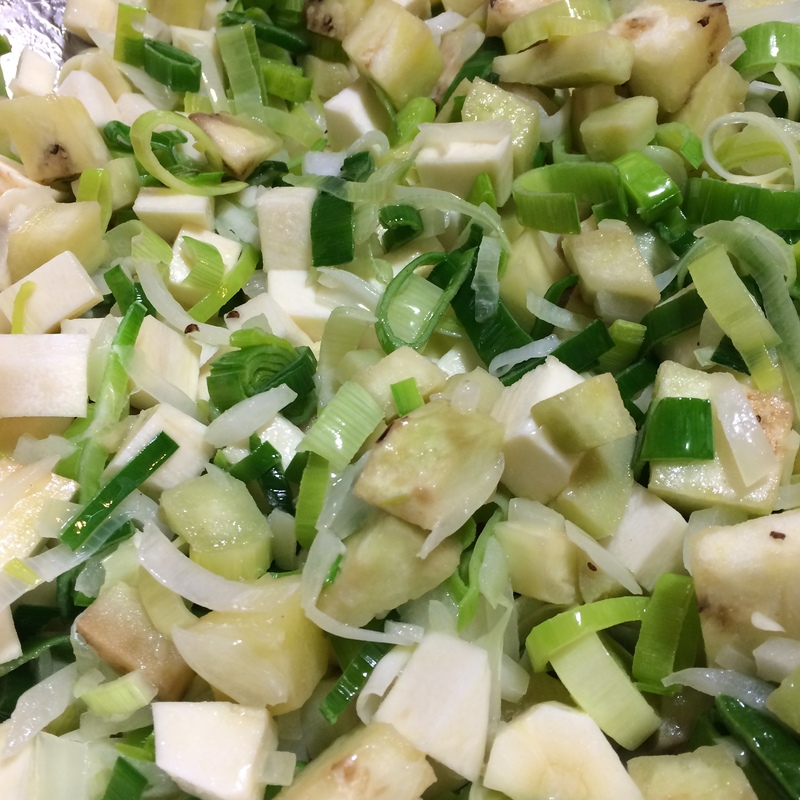 Then, add the leeks, onion, garlic, eggplant and a pinch of salt and pepper (no more than 1/4 tsp each) and cook, covered, on a low-medium heat for about 10 minutes or until all the vegetables are soft. Add 1 cup of the vegetable broth, cover and simmer for 10 minutes or until the broth has been absorbed. 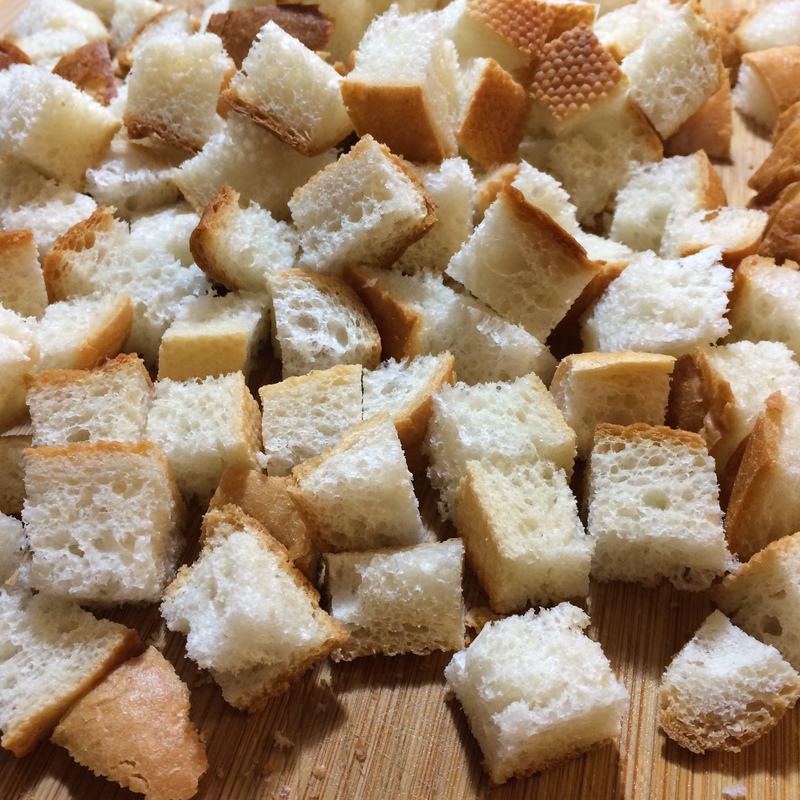 Slice the bread into 1-inch cubes and lay them in the bottom of a casserole dish. Sprinkle the sage and rosemary over the bread. 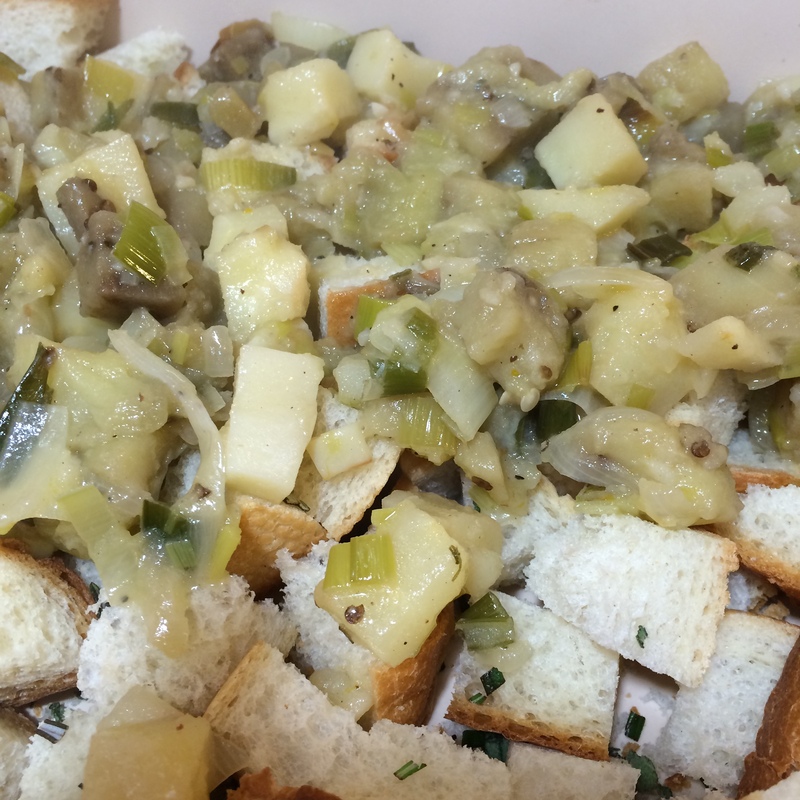 Then, pour the vegetable mixture over the bread as well. Spread it out so it evenly covers the bread. Pour the remaining cup of vegetable broth over everything, gently pushing aside the vegetable mixture to allow the broth to work through to the bread and the bottom of the casserole dish. Bake, uncovered, for 40 minutes. 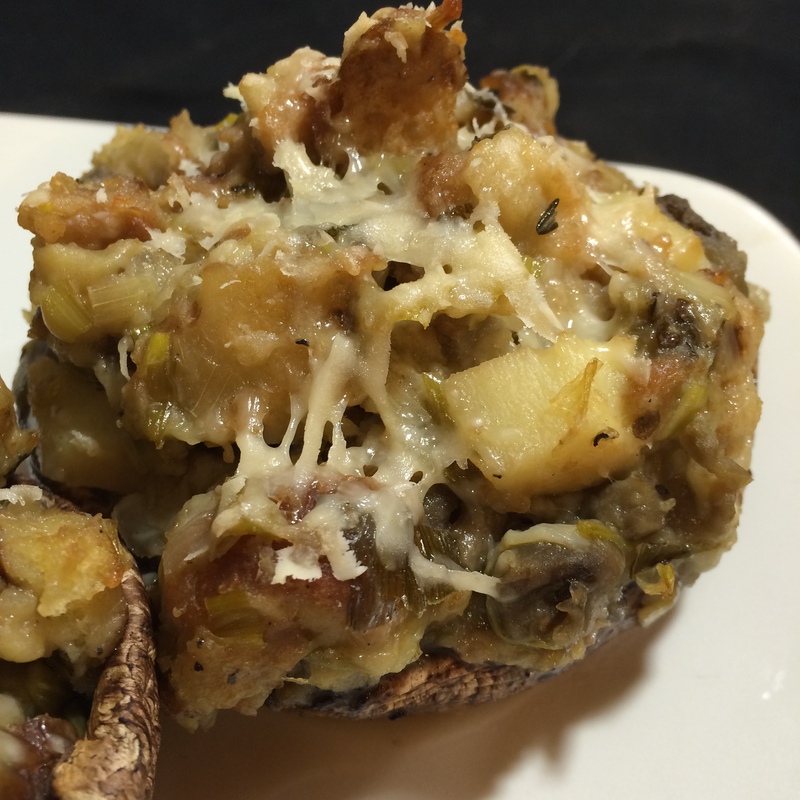 While the stuffing is baking, gently clean any dirt off your mushrooms. 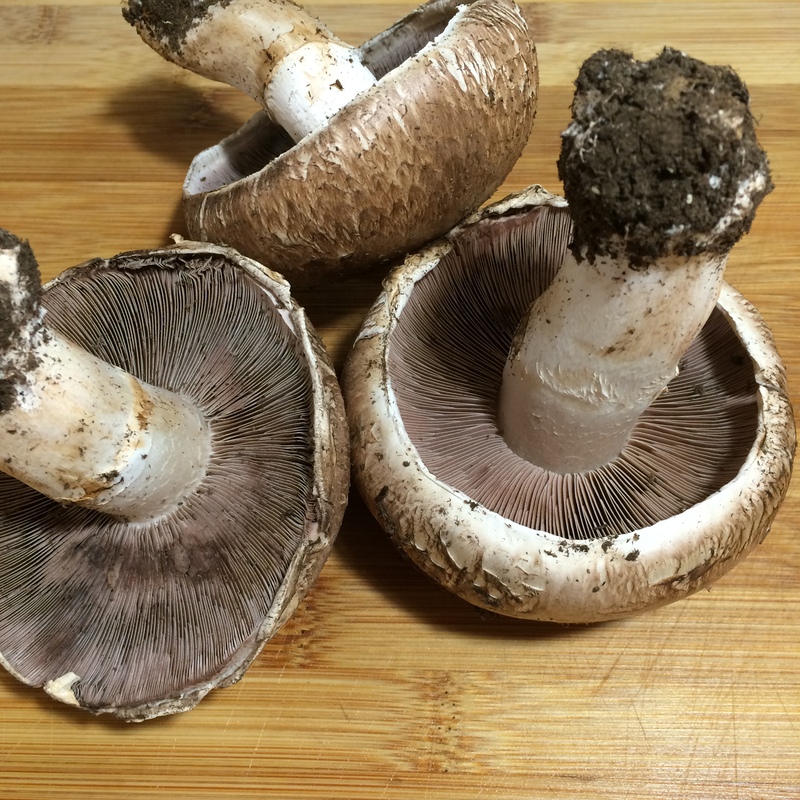 Slice off the stems and gently dig out the gill-like material on the underside of the mushroom caps. 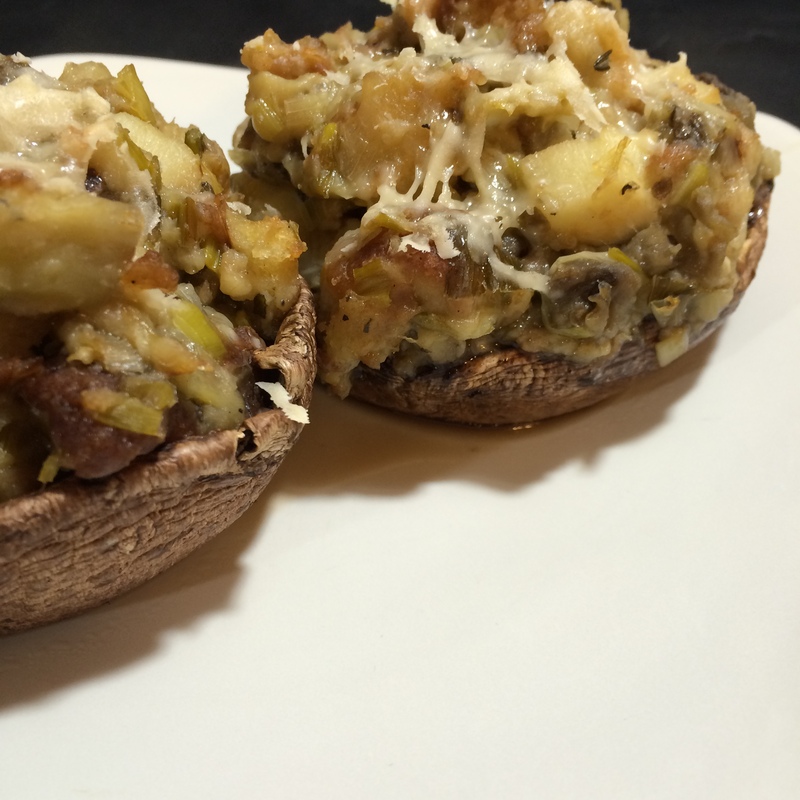 Place the hollowed-out mushrooms cap-side down in a baking dish and bake them in the oven (also at 350F) for about 10 minutes or until they begin to look slightly droopy or wilted. A small amount of liquid might appear inside the caps – this is a good way to know you need to remove them from the oven. 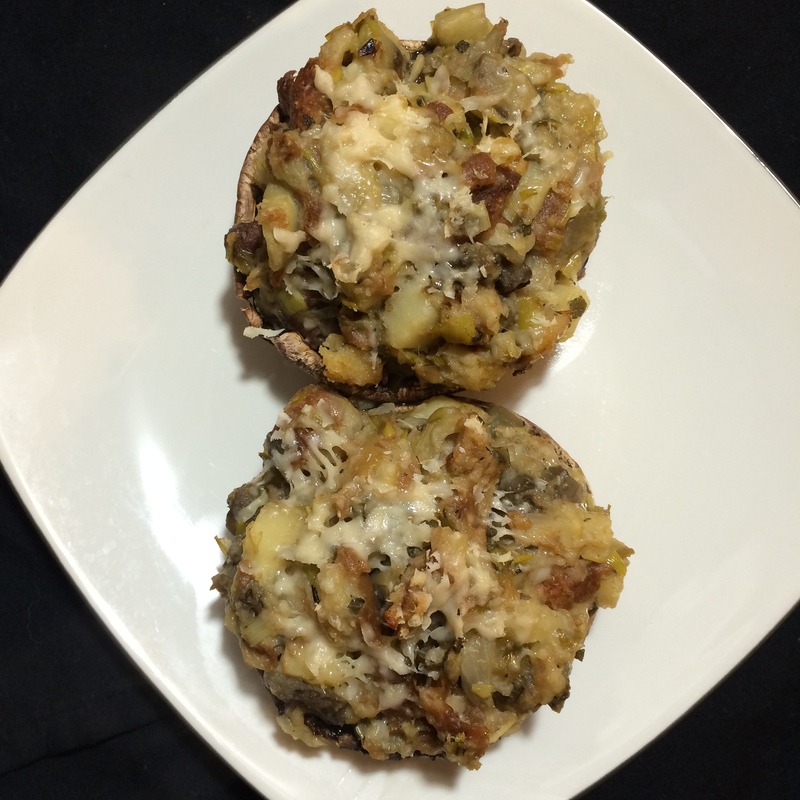 Once the stuffing is done, add a generous scoop of stuffing to each mushroom cap. Top each with a tablespoon of cheese and place back in the oven for about 5 minutes or until the cheese is melted. These make for a gorgeous presentation lined up on a serving tray. I hope you enjoy them as much as Mike and I did! 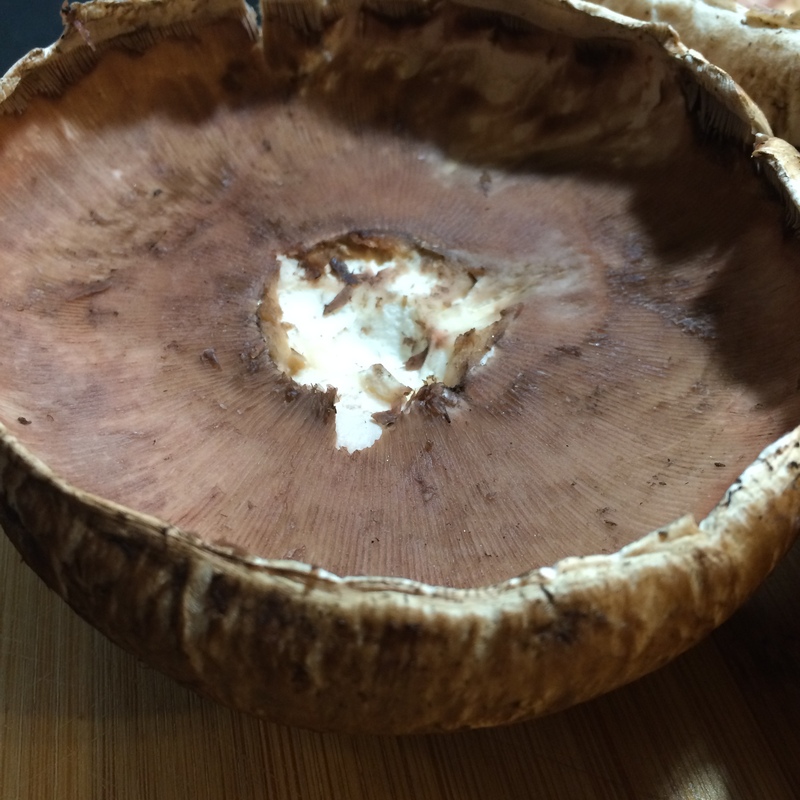 Pro-Tip: Try to pick out portobello mushrooms that have high sides so they’re more cup-shaped instead of flat. These will maintain their shape a lot better after being heated up and make it easier to stuff them.